M.S. in Optical Engineering, Nanjing University of Science & Technology, Nanjing, China. B.S. in Precision Instrument, Nanjing University of Science & Technology, Nanjing, China. 1. F. Du and S. T. Wu, “Curing Temperature effects on liquid crystal gels”, Appl. Phys. Lett., 83: 1310-1312 (Aug. 18, 2003). 2. F. Du, S. Gauza and S. T. Wu, “Influence of curing temperature and high birefringence on the properties of polymer-stabilized liquid crystals”, Optics Express 11: 2891-2896 (Nov. 3, 2003). 3. Y. Q. Lu, F. Du and S. T. Wu, “Polarization switch using thick holographic polymer-dispersed liquid crystal grating”, J. Appl. Phys., 95: 810-815 (Feb. 1, 2004). 4. Y. Q. Lu, F. Du, Y. H. Lin and S. T. Wu, “A variable optical attenuator based on polymer stabilized twisted nematic liquid crystal”, Optics Express 12: 1221-1227 (Apr. 5, 2004). 7. Y. Q. Lu, X. L., Y. H. Wu, F. Du, and S. T. Wu, “Dual-frequency addressed hybrid-aligned nematic liquid crystal”, Appl. Phys. Lett. 85: 3354-3356 (Oct. 18, 2004). 9. Y. H. Wu, X. Liang, Y. Q. Lu, F. Du, Y. H. Lin, and S. T. Wu “Variable optical attenuator using polymer-stabilized dual-frequency liquid crystal" Appl. Opt. 44, 4394-4397 (July 10, 2005). 4. F. Du, S. Gauza and S.T. 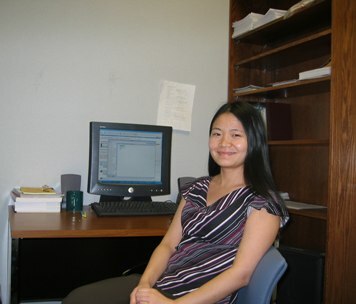 Wu, “Polymer-stabilized liquid crystal for variable optical attenuator applications”, presented at Optics in the Southeast (2003). 6. F. Du, Y. Q. Lu and S. T. Wu, “A Novel Optical Switch Based On Electrically Tunable Liquid Crystal Photonic Crystal Fiber”, MRS Fall Meeting (2004). Problems regarding this web site should be directed to Yi-Hsin Lin. Last modified: 09/30/05.